Alcohol and tobacco prices have been driven by increased taxes; in education and health governments are either the biggest customer or service provider; housing prices have been driven by a mix of government supply constraints (slow release of land) and government demand encouragement (favourable tax treatment, large population growth, increased foreign ownership, lax regulation on home loans, first home buyer grants). However, this is not an argument against government services and for more privatisation - in many of these categories we have already privatised the assets and it is the "regulated" private sector that has driven prices higher. I am suggesting that regulators in many of these industries - like the banking royal commission concluded - have been captured. This has a number of investment implications. The first implication is that inflation is going to be hard to generate. I am very much on the secular stagnation side of the inflation debate, arguing that a mix of overindebtedness, increased inequality, automation and high levels of immigration are keeping wages and inflation low. 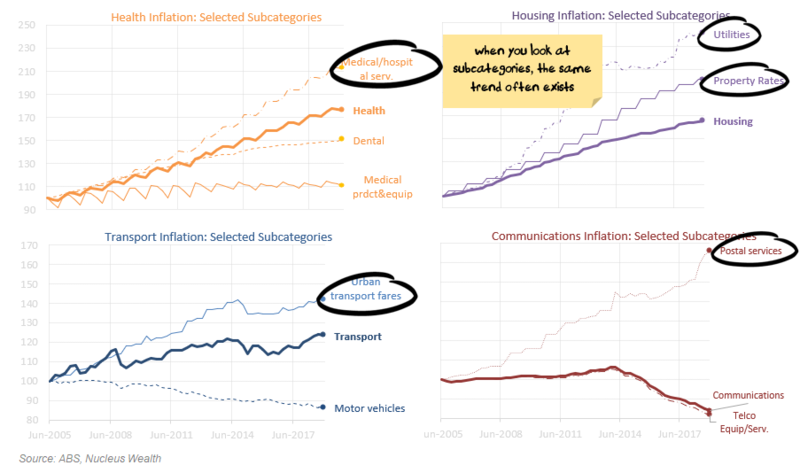 The inflation charts above are more evidence of secular stagnation - if the only sectors able to raise prices are those regulated by governments then the real economy is weaker than it appears at the headline level. Australia is going to need lower interest rates, and quite likely unconventional monetary policy, to generate inflation. The next investment implication is that you are better off looking for sectors that have to convince a regulator that prices need to increase rather than sectors that have to compete with other companies and convince consumers to pay more. Make no mistake, this is a sad indictment of the state of the Australian economy. It is not sustainable in the long term, bad for consumers, bad for competition and bad for the fabric of society. As an example of how this has played out over the last 20 years, take the utility and infrastructure sector. This is a low risk, low volatility sector that should, in theory, earn low and steady returns - say 6-8%. This sector often has monopoly assets which are allowed to earn a certain return on what has been invested. Many assets have regulatory meetings where the companies (working for shareholders) and the regulators (working for consumers) argue about discount rates, betas, risk-free rates, risk premia and a range of other arcane details. Other assets, like toll roads, negotiate with politicians and unsurprisingly the deals tend to be good for the consumer (bad for the company) in the period until the next election and bad for the consumer (good for the company) in the long term. These returns speak for themselves. The bottom 3 companies fall into the expected range, the rest of these "low risk, low return" stocks are in fact among the best-performing stocks on the ASX. The regulators and politicians look like they are either captured or overmatched. Will things change if Liberals get back in? There have been no signs of policy changes on this front and arguably it will get better for companies / worse for consumers, with a grab bag of subsidies and direct action amounts available. Money spent on lobbyists is likely to be a better investment than anything else. Will things change if Labor gets in? It is hard to tell. Certainly investors will need to be more wary. Keep in mind that Labour was in power for a large part of the returns above and so do not have a history of holding the companies to account. My guess is that Labor is picking fights already with a reasonable number of vested interests (property, franking credits) and it won't want to expand the list of vexed vested interests. More evidence of secular stagnation = stay long Australian government bonds. Evidence that regulated companies have more pricing power than unregulated = stay long the lobbyists and their clients. Scary facts on utilities etc. Licences to print money at taxpayer expense. What are governments thinking? How much corruption is involved? I reckon we have no idea how much crooked business goes on in Australia, behind our backs.